Mr. Generosity himself, author Tony Hays, is offering up 2 hardcover copies of his book The Divine Sacrifice to 2 lucky readers of PTTP! Thank you Tony! 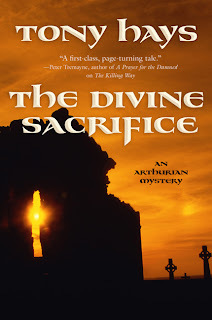 The Divine Sacrifice is the follow up book to The Killing Way , which was also a recent giveaway here and is due to be released on March 30th. TO ENTER leave a comment and please include your email address. Only one entry per person. US & International entries accepted. Ends on March 30th. SYNOPSIS: The Divine Sacrifice continues the story of King Arthur's conselor, Malgwyn ap Cuneglas, a solider who lost his arm in battle but was saved by his king. Malgwyn hated Arthur for this gift, but he has come to grudgingly acknowledge that he yet may have some purpose in life. Arthur and Malgwyn are called to the abbey of Glastonbury to settle a matter of great political importance—tin is being mined for export to the Empire. While there, Malgwyn and Arthur meet St. Patrick, a legend in the Church who is there on a mission of his own, to root out the heresy of Pelagius. When an aged monk is found cruelly murdered in his cell, Malgwyn is set with a problem that will test his skills as an investigator. His search for the truth may uncover a conspiracy that could endanger the kingdom. Gritty and powerful with a true ring of historical perspective, and a character who sees more than those around him, The Divine Sacrifice is a historical mystery that will hook mystery readers and historical fans alike. Definitely count me in for this one. I'd love to win it. Sounds great. Please enter me! It sounds like an intriguing novel, thank you for this chance to win a copy. please sign me up! thanks! These look like great reads! Oh! Id love to be entered for this one! Thanks! Oooh, historical mystery! Count me in! Please enter me for this one - it looks intriquing!! I like the sound of this series. I have many friends that read mysteries. They are currently looking for new authors. I need to read it soon, co I can recommend this book. I tried towin the first one but didn't so I am having to try and get the cash to buy it. But I wouldn't mind getting the second one already ! Sounds great. Camelot era, King Arthur, St Patrick and a murder mystery in hardback (I usually have to settlefor paperbacks)! What more could one want. I am a Follower and International entry. Thank you for making the contest open to all. Much appreciated. Please enter me. I love historical fiction and anything to do with King Arthur! I would absolutely LOVE to read this book - thanks for the chance to win a copy! An Arthurian Mystery - what fun. I would love to read this book. please count me in. I enjoy good mysteries, and I love King Arthur. This book sounds great. Thanks for the giveaway. Sounds like a good mystery I could enjoy. Have wanted to try some set in a time period earlier than Victorian England. Incorporating it into the Arthurian legend makes it even more interesting. Sounds fantastic. Count me in, please. Thanks! I'd love to read this book - please count me in! I really enjoy mysteries. Please enter me. Thank you!